It has been 38 years since I completed restoration of my 1930 Ford Model A Roadster. Since it was completed the car has appeared in many parades and auto shows. While searching for parts during the restoration, I discovered there was a need for a local Model A parts supplier. So shortly after completion of the car I started Doug's Antique Ford Parts. For about 27 years now the business has been one of the only Model A part suppliers of reproduction parts in Arkansas. Since starting the business, I have expanded the line and now offer parts for 1928-1948 cars and trucks. My business is located at 16921 Crystal Valley Road in Little Rock, Arkansas where I also operate Arkansas Brake & Clutch. The Model A Ford was the long overdue replacement of the Model T when it was introduced in 1928. For a number of months the "new Ford" was back ordered until production could meet demand. All Ford production was shut down for the conversion to the Model A. The base price of the Model A was $450. Despite the start of the Depression, 4.5 million Model A's were sold in the four years it was produced. Sales of the Model A peaked in 1930. 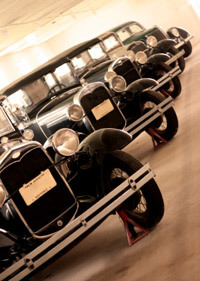 The Model A featured a 200.1 cubic inch four-cylinder engine and four wheel brakes. The Model A deluxe roadster sold for $795. The addition of "deluxe" to the name was made after Henry Ford decided to dress up the car to combat declining sales. The deluxe roadster featured flashy paint, a luggage rack and other "extras." The Model was replaced in 1932 by the V-8 Ford. It is easier than ever for anyone to restore the Model A. Every part of the car, excluding the chassis and engine, is being reproduced by a variety of companies. Call Doug - 501-455-2562, anytime Monday thru Friday between 9 a.m. - 5 p.m. (CST).